There are about half a dozen of them, sitting around the table, playing cards clutched in wrinkled hands. Another three or four watch from the side-lines or standing behind. There seems no concern that anyone might be cheating by communicating a hand to another player. We’ve had to disturb one of them, the café owner, because we’re looking for a coffee ourselves. He’s very friendly, but he also wants to get back out there with his friends, we are a distraction. He keeps looking past us, out the door to where they are all sitting, he might be missing something. They are not unique to this place. You’ll find them everywhere – anywhere with sun to shine on their backs, and shade to cool them; close to a source of fairly regular coffee, or perhaps something stronger; where they don’t mind strangers looking on, and where they can ignore them completely. I can’t understand a word they are saying, but by the body language and outbursts of laughter, I can see they are pretty much just a regular group of boys, enjoying each other’s company; a filthy joke here and there; laughing expansively at the expense of one of their companions. And they laugh so hard because they know that at any moment, the focus of this humour can turn and gaze them full in the face. I suspect their wives might just be glad they’re getting out of the house. Old people and markets seem to become a cliché of the tourist photographers portfolio – I have quite a few in mine. They express colour, and wisdom, age, freshness, life at its opposite speeds, it’s opposite ends. Surely, there is nothing new to document? But – maybe there is, if you’re very lucky. A look, a gesture, an interaction. Occasionally, an eye expressing an entire history stares directly down the camera lens at you, challenging. I am not a tourist attraction, son. 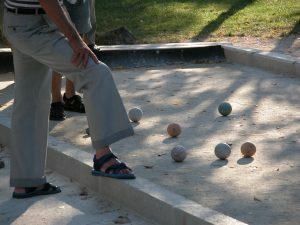 You’ll see them around the world these old boys – maybe the same ones, international, geriatric playboys, following summer around and making their money by playing cards, or a lucrative game of boules. It’s taken them 65 years or more to recognise that this is what they should be doing with their lives – sitting around in the sun, doing nothing, just talking, being with friends. While the rest of us look on, commenting that we should be doing exactly that. Then taking a couple of photos, turning away and carrying on, as we were.